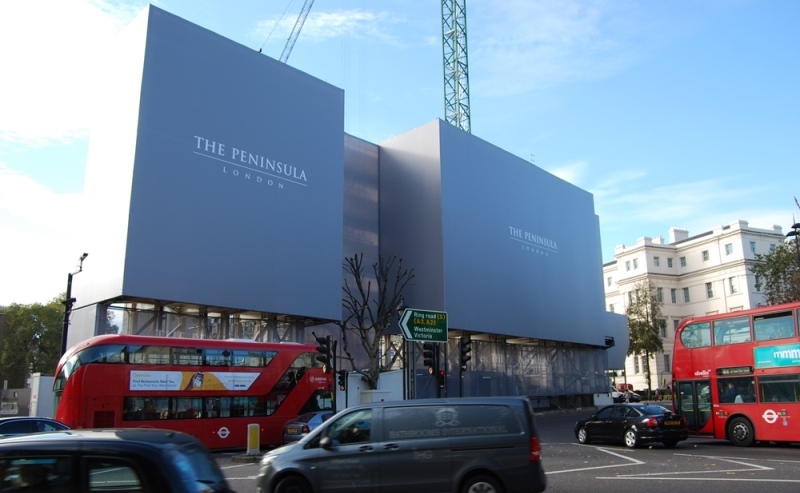 THE DEVELOPMENT A new hotel, The Peninsula London, is undergoing construction at 1-5 Grosvenor Place at Hyde Park Corner in London and will replace 1950s and 1960s office buildings. Due to open in 2021, the luxury hotel will boast 190 guest rooms, a spa, bars, restaurants, meeting facilities and a grand ballroom. The Peninsula Hotels is one of the world’s leading small luxury hotel groups.  Established in 1928, the group’s hotels are centrally located in ten destinations across three continents. 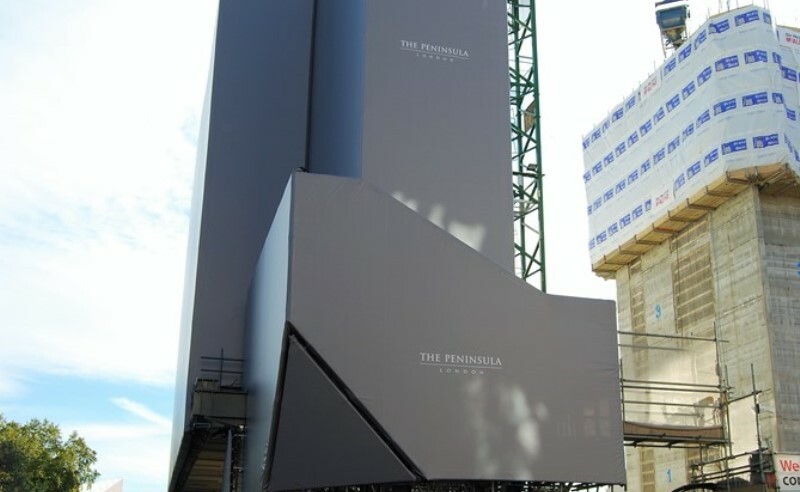 THE BRIEF Embrace Building Wraps were appointed by The Hongkong and Shanghai Hotels Limited to fully project manage and wrap scaffolding, steel supports, site offices and welfare cabins. 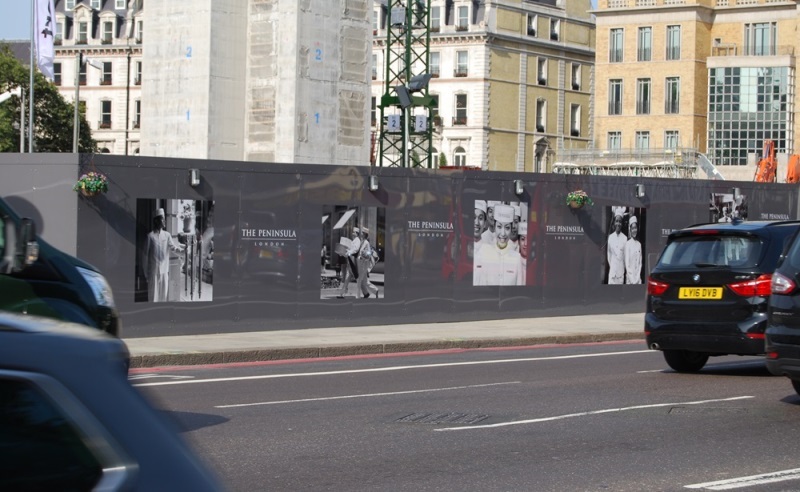 Additionally the brief included enhancing the streetscape through the use of printed site hoarding graphics at street level to disguise the unsightly hoarding and create a premium environment whilst the works are underway. THE SOLUTION The Embrace Building Wraps team delivered a ‘one stop shop’ project management service, working very closely with our client, their Development Manager Prime Development and Sir Robert McAlpine, the main contractor on site. Given the high traffic location this required intricate and detailed planning, including arranging planning approval with Westminster Council from original creative design assets provided by the client. Embrace managed the full digital print & installation of the graphics on the site hoarding and giant PVC wrap, working both day and night on the installation within our agreed scope of works. The complex project was completed one week ahead of schedule and on budget. Giant PVC wrap The giant PVC wrap was installed using offset frames over the site offices and cabins. The 1,365 square meter banner comprises of six separate sections meticulously measured and seamlessly combined. A combination of solid PVC and wide gauge mesh materials were employed to reduce the wind loadings. 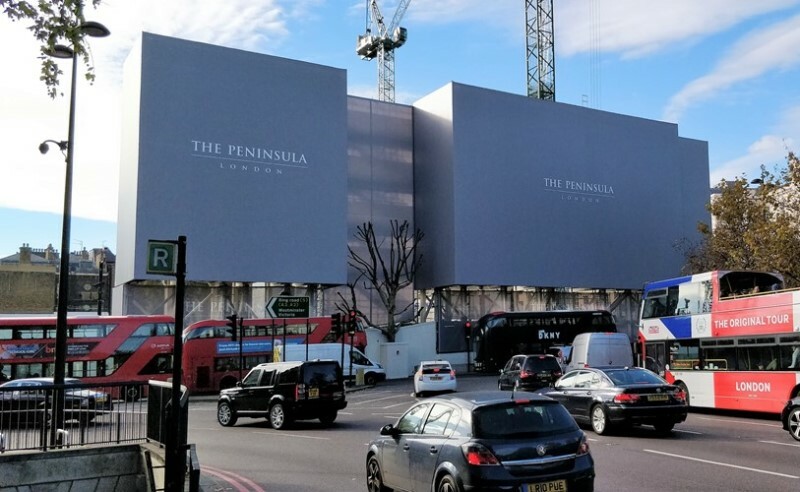 Given each frame was independent we triple measured various elevations to ensure that the logos on the upper and lower banners aligned perfectly on the front and north side of the structure to precisely deliver the approved creative. 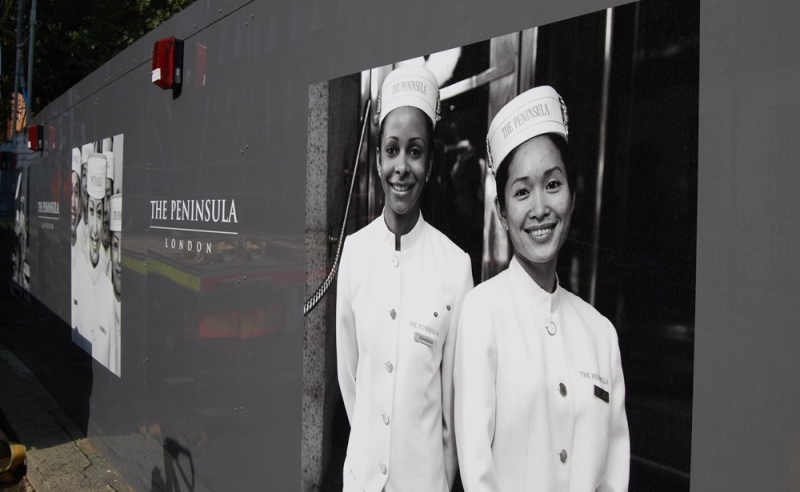 Site hoarding graphics The graphics applied to site hoarding stretch across 203 linear metres at street level and tell the story of the The Peninsula Hotel for people passing by. High gloss printed ACM DIBOND sheets were deployed to deliver a top quality impact and durable finish. The sheets were seamlessly applied over site hoarding that varied in height from 2 metres to 3.3 metres over five sections. The coverage area also stepped up and down along the elevations and including two dual-sided tunnels. Two sets of clear Perspex viewing windows were integrated to allow passing pedestrians to safely take a look at progress within the construction site and to see the team at work. 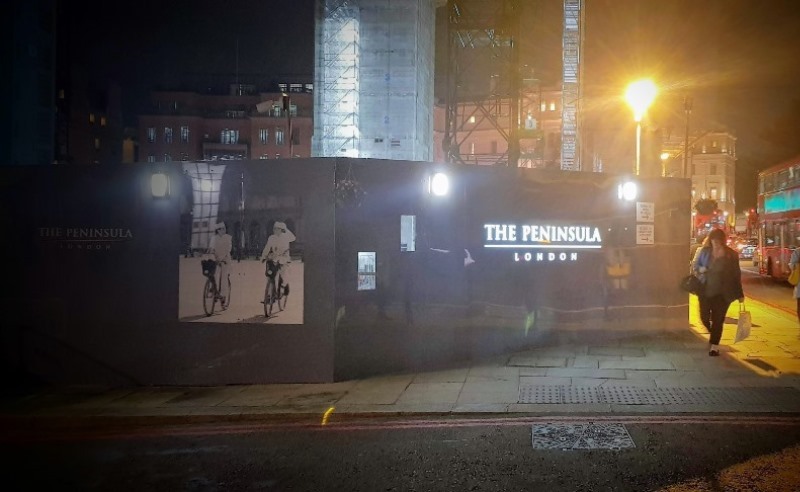 Finally a three metre wide back-illuminated logo finished the stunning installation, utilising an integrated lightbox to provide impact at any time of night or day.